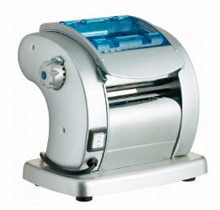 The Imperia Pasta Presto Electric Pasta Machine - The classic Imperia pasta machine with an integrated solid state motor that provides simplicity, easy of use and speed. The powerful electric motor allows you to make your sheets of pasta even quicker than before in six different thicknesses and two types of pasta: tagliatelle and fettuccine. Other pasta attachments available. Made in Italy.